■Large blue black light LCD for detailed real-time UPS status display. ■Advanced online pure sinewave power supply system, with bypass maintain switch, It can provide a reliable, high quality AC power source to the precision equipments, can be used widely in different fields. ■Widely used to computer equipments, teleco. LCD Display input/output Voltage, Frequency, Battery voltage, Battery capacity, Loading rate. Online is that no matter whether the power network voltage is normal, the AC voltage of the load should be through the inverter circuit, that is, the inverter circuit is always in the working state, the 20 kva online UPS is generally a double conversion structure. 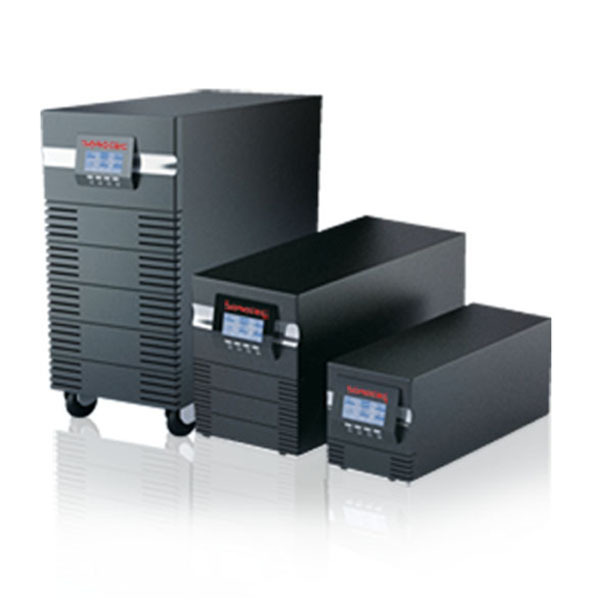 The so-called double transformation refers to the normal operation of the 20 kva online UPS, the power through the AC/DC, DC/AC two times after the supply load. This 20 kva online UPS uninterruptible power supply keeps the inverter in the work of the state. First of all, it is through the circuit changes the external AC to DC, through high quality inverter will DC conversion for high quality sine wave AC power output to the computer. The main function of the 6 kva online UPS in the power supply situation is the voltage regulation and the prevention of electric wave interference, while the battery charging management; in the power outage, the use of standby DC power supply (battery) to the inverter power supply. Due to the inverter has been working, so there is no switching time problem, suitable for the power supply have strict requirements of the occasion.